Do sector based mutual funds still attract investors? We have earlier analyzed some of the best performing mutual funds in sector based category and planned to review them after 3 months. This article talks about our updated view on this sector based mutual funds. Sector based mutual funds invest money in specific sectors equity stocks only. For e.g. FMCG sector mutual funds invest money only in FMCG sector companies. There are various sector based mutual funds like FMCG, Pharma, Technology and Banking and financial services. These mutual funds would concentrate mostly on a particular sector. The returns from this sector would depend directly on the industry performance. Say technology sector mutual funds invest in technology sector like IT/Software/ITES companies. Currently there is downtrend in this industry performance in the last 2 to 3 years in India. Hence its performance is directly impacting the performance of the technology based mutual funds. Technology sector mutual funds gave an average of 6% per annum over the last 3 years which is far below the bank fixed deposits. Now let us study the performance of 4 categories of sector based mutual funds, banking and finance sector, Technology sector, Pharma sector and FMCG Sector. Banking and finance sector based mutual funds: This sector based funds have still under performed and have provided an average annual returns from 9% to 11% in the last 3 years. This sector would continue to perform in similar lines and may provide the returns above the bank fixed deposits. Invest in these sectors based mutual funds if you are expecting returns above bank fixed deposits. 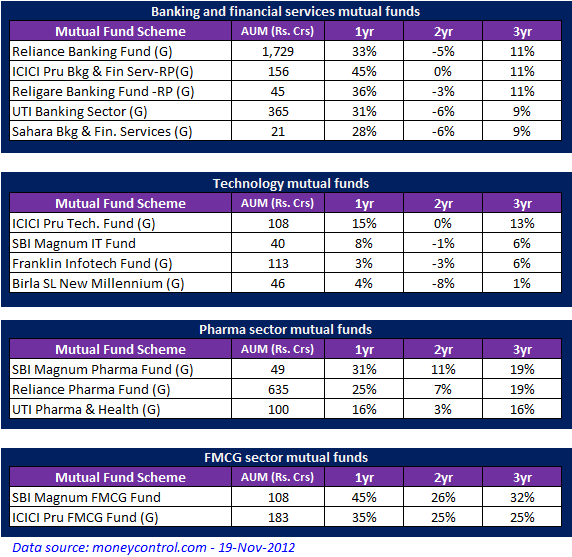 Technology sector based mutual funds: Technology funds has been underperforming in the last 3 years. Except for ICICI Prutech which has provided returns of 13% in the last 3 years, other mutual fund schemes has provide only 6% annualized returns which are fall below the bank fixed deposits. With the current downtrend in the technology stocks and the no growth seen in next 1-2 years, we would believe that this sector would under perform in 2013 also and request investors to stay away from this Technology sector based mutual funds. Pharma sector based mutual funds : This sector based mutual funds are providing good returns ranging between 16% to 19% annualised returns in the last 3 years. Due to growing demand in healthcare and pharma, this sector would continue to outperform in future. Investor can invest in this sector based mutual funds. Top-3 mutual funds in this category is given below. FMCG sector based mutual funds: This is one of my favorite and best performing mutual funds categories. As indicated in our previous article, FMCG sector is providing excellent returns in the last 3 years ranging from 25% to 32% annualized returns. We re-iterated this in our “10 ways to double your money” article, that this is the only best performing mutual funds option where the money is expected to double in 3 years by investing in FMCG sector based mutual funds. However past performance may or may not repeat, but we still continue to believe that this sector would provide good returns comparing to other sector mutual funds. Top-2 mutual funds in this sector is given below. Conclusion: Sector based mutual funds has not gained confidence from the investors. Technology based mutual funds are showing continued underperformance. Banking and financial services mutual funds are performing good comparing to returns from bank fixed deposits. Pharma sector is providing good performance and FMCG sector funds are showing outstanding performance. Invest in these top-5 mutual funds (Top-3 in Pharma and Top-2 in FMCG) to get highest returns.